Born: April 23, 1802 in Pocasset Ma. Died: October 14, 1840 at 38 yrs. To: Mary Swift; (1806 – 1864) (Moses Swift, Jr. & Rebecca Nye); Mary married (2) Calvin Redding (1815 – 1878) (Calvin Redding & Lucy (Hall) Morse) in Sandwich Ma. on May 22, 1850. 1. Benjamin Franklin Howard; (December 15, 1830 – November 11, 1914); Married Sarah Ellen Mailey (1837 – 1890) (Nicholas Mailey & Betsey Lewis) in Lynn Ma. on June 8, 1854; Benjamin, a shoemaker, died in Lynn Ma. 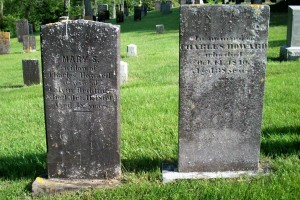 at 83 yrs, 10 mos, 27 d.; Benjamin & Sarah are buried in Pine Grove Cemetery in Lynn Ma..
2. Bathsheba Ellis Howard Barlow; (April 18, 1833 – March 21, 1909); Married Lewis Nye Barlow (1827 – 1887) (Levi Lincoln Barlow & Sarah/Sally Lumbert) in Lynn Ma. on January 11, 1858; Lewis married (1) Lucy H. Parker (1827 – 1892) (Jonathan Parker, Jr. & Jane Maria Hinds) in Sandwich Ma. on September 25, 1848; Lucy married (2) Henry C. Hewins (1829 – 1878) (William Hewins & Love Handy) on Abt.1862; Bathsheba & Lewis are buried in East Cemetery in Meriden Ct.; Lucy & Henry are buried in Oak Grove Cemetery in Falmouth Ma..
3. Mary Ellen Howard Bates Everett Kimball; (August 22, 1835 – March 10, 1882); Married (1) Reuben G. Bates (Abt.1831 – 1858) (Nymphas Bates & Sarah (–)) in Haverhill Ma. on March 16, 1854; She married (2) Leonard Everett, Jr. (1827 – 1861) (Leonard Everett & Nabby (–)) in Dorchester Ma. on December 30, 1860 (Leonard’s second marriage) & married (3) Sylvester Kimball (1820 – 1893) (Hezekiah Kimball & Abigail Elkins) in Brookline Ma. on February 2, 1874 (Sylvester’s third marriage). 4. Leonard Everett Howard, Civil War; (January 13, 1838 – January 1, 1919); Married Anna L. Herring/Howard (1847 – Aft.1930) on November 1, 1866; Leonard is buried in Pine Grove Cemetery in Lynn Ma. 5. 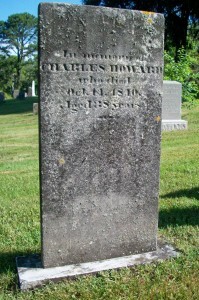 Charles Lloyd Howard, Civil War; (April 3, 1840 – April 7, 1863); Charles died in a Brooklyn N.Y. Hospital; He is buried in Cataumet Cemetery.